Bartending seems like it would be a super fun, super social job. After all, you’re serving drinks and chatting all night. How bad could that be? The reality is, unlike how the movies portray it, bartending is more than just mixing, shaking, and socializing. Bartending may look like it’s an easy job but don’t let that fool you, there is quite a bit of hard work involved in bartending. On the most part, it’s all work and no play; bartenders get off work too late for the "play" part. Bartending can be a decent paying, rewarding career. Read on about what to expect when thinking about becoming a bartender because the more realistic your expectations are, the more successful you can be. Bartending may look like a kind of exciting job where you mingle with the people, and you woo all the guys or gals. But, it’s not all fun and games. There is actual work involved, in addition to the socializing and drinking that goes on. Find a local bar-tending course. It’s not always easy work. Sure, it’s fun to chat with the customers, and you’re creating some palate pleasers. But, standing on your feet all day, and sometimes dealing with drunk, disorderly, and downright nasty can take its toll. You have to be friendly to your customers, even if you’re in a bad mood. In the movie, Madagascar, one of the best one-liners totally fits the bill here. You have to learn to ‘smile and wave,' even if you want to frown and make nasty hand gestures. Just think about the potential tips, that should keep you going. You need to know how to set boundaries. Sure, being nice to your customers may reap big tips, but you also don’t want to be too nice. It may send the wrong signals. Unless, of course, you mean to do that. Then, carry on. Bartending comes with no extra perks. You may be on your own when it comes to benefits of any kind. So, you’ll need to keep that in mind and budget accordingly. Because you’re also not going to have any true consistency when it comes to income, aside from your hourly rate. The work hours are fit for a vampire. Most people do their drinking in the evening so; you won’t be part of the traditional 9-5 job market. Instead, you’ll be serving them their drinks while they complain to you about their rat-race life. Smile and wave. You’re not just getting people their drinks. In fact, part of the job description for bartending is stocking the bar, making sure the glasses are clean and plentiful, clean the counters, tables, and other areas, and whatever else the place you are employed needs you to do. People say you’re the life of the party. Ok, maybe not. But, if you are flirty, fun, and fabulous, it’s likely that your tips will increase. If someone doesn’t know what they want to drink, ask them what type of alcohol they like and whip them something up. Customers appreciate the guidance. Remember the risks involved with bartending. You’re working around people who are drinking, and sometimes (ok, often) in excess. Things can sometimes get out of hand. Which means, you need to keep a constant eye on what’s going on around you. Also, you need to be mindful of fake ID’s because the minor isn’t the only one who can get in trouble for drinking. You served them, so you’re equally responsible. You can’t just walk into a bar, apply for a bartending job, and expect to get it. Well, maybe YOU can, but it doesn’t hold true for the majority. Legally, you have to be a minimum of 21 years of age to serve alcohol but, in some states, that minimum age may be 18. Many bartenders start out as barbacks, which are the people who help out the bartender by making sure all the drink garnishments are plentiful and, if not, the barback prepares them, restocks the liquor bottles, and replenishes napkins, toothpicks, and other products found in a bar. While some places may require you to go to bartending school, most bartenders are trained on-the-job. The bartender training may last a few weeks working alongside an already experienced bartender. The bartender-in-training, under the tutelage of the seasoned professional, will learn the finesse of fixing drinks and the know-how of handling humans consuming alcohol. Along with other tricks of the trade. Some bars will expect their bartenders-in-training to self-study, whether it’s through an online course they recommend, or through books. Your employer will instruct you on what they expect. When it comes to the need for attending bartending school, the reports are conflicting. Some say that it’s a waste of money because they are expensive and there is no return on the investment, most bartending schools are completely out of touch with what the customers want. Buying books instead of paying for the school is the consensus. You can learn how to mix those new and fancy drinks by studying on your own and your friends most likely won’t mind serving as Guinea Pigs. Being a bartender requires absolutely no formal education. However, there are bartending schools out there who will serve up a ton of bartending education in a short amount of time. For the most part, bartenders do not even need a license, let alone a diploma. Although some states do require bartenders to have a license to serve alcohol, that varies as much by the state as it does by a city. Look for bartending schools that have more than 40 hours of instruction because only 40+ hour courses are accredited, and if you’re going to spend the money, you want the accreditation. Expect the course to run between one to two weeks. ABC Bartending is the largest bartending school in the nation. It offers courses in 30 states and certification in nine. They often have coupons over on Groupon, if that tells you anything. However, their bartending course teaches their students everything from mixing drinks, to making a resume. And, in some of their locations, they offer job placement. When you consider bartending schools, ABC Bartending Schools are the Ivy Leagues. When it comes to bartending, being qualified outweighs being certified. Meaning, you may have earned a bartending certification but you still are not a people person, and you pour a lousy drink. To be a bartender, qualifications such as an outgoing personality carry a lot more weight. Bartending school can cost between $30 for online courses to over $400 for on-site instruction. There isn’t a license or certification that is specific to being a bartender. Do NOT fall for the false claims that you can find online. And, there are quite a few. However, as we mentioned in the previous section, some states and cities may require bartenders to have a license enabling them to serve alcohol, but each area may be different. If the location you’re working in states you need a license to serve alcohol; you will have to take a short course that lasts anywhere between one to six hours. You’ll learn about the local laws about drink limits for customers, pricing the drinks, and a whole bunch of information you’ll need to know as a bartender. You may also be taught how to recognize fake ID’s, how to diffuse potentially violent situations, and the signs to notice if someone had one too many. The whole point of this licensing class is to teach the liquor laws and how to act responsibly as a bartender. Most likely, being hired won’t be weighted on whether or not you have this license, but you will end up needing to get it once you sign the new hire forms. Never fear, getting certified does not come with a large price tag. It will cost around $25-$50, depending on where the class is being held. Some places only hold classes once a month. If you are required to get a license in your area, apply as soon as you get that bartending job. That license needs to be in your hard within a particular amount of time from your start date. Also, if the bar you get a job in expects you to serve food, then you may also need a food handler's license. The license only costs around $10 and can be taken online. How you act behind that bar will determine your success. From the way you carry yourself, to the way you interact with the crowd can pretty much influence the kind of tips you can expect. 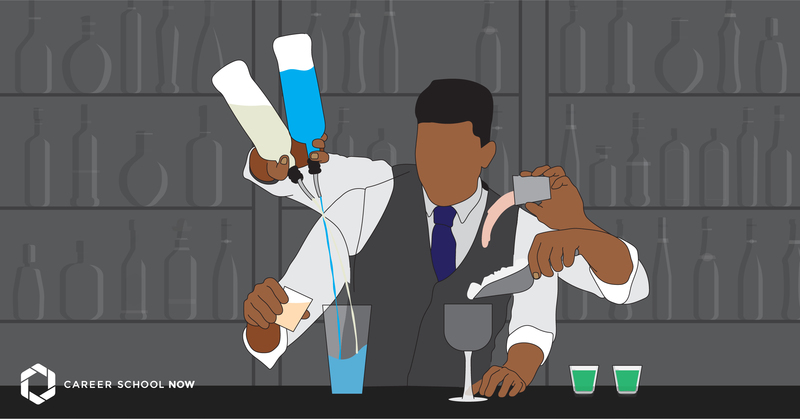 There are particular ways a new bartender should act that will almost guarantee success. Be professional. Dress the part, act respectable, and treat people with respect. Know the types of product the bar serves. For example, you work at a wine bar, learn the wines. Don’t stop moving. One rule of retail sales, and selling alcohol is no different, look busy at all times. It will also impress the bartender who is training you. Keep your hands out of the tip jar. You are getting tips because the more experience bartender is training you. The tips will be divided at the end of the night but leave it up to the head honcho, and it will establish trust. Short and sweet talk. Part of the fun that comes with bartending is the social side. But, as a new bartender in training, don’t get stuck in conversations. You’re still in a learning process, and you don’t want to make those who are training you angry. Learn the dance. In other words, you’re new to this bar floor, stay out of everyone’s way until you learn the moves. Do what you’re told to do and if no one is telling you to do anything, clean the bar. Attitude is everything. To be a successful bartender, a good attitude and a smile are two important things to bring with you to work. It’s okay to make suggestions. Sometimes, the only thing a customer knows what they want is a drink. After that, they have no clue. So, it’s a great thing to get an idea of what that customer likes and make suggestions. Not only does it help the customers, but their gratitude may translate into a nice tip. Work on your memory. Busy bars mean a lot of drink orders thrown at you all at once. You’ll need to somehow keep track of what you’re making and for whom. Don’t focus on the tip jar. Sure, tips are a huge part of your livelihood when you’re working as a bartender. Focusing on the dollars detracts from doing your bartending best, and it will show. Always remember to ask for ID. Always. Ask. For. ID. Serve someone under 21, and you can be faced with major legal issues, plus potentially be unemployed. Card customers! The definition of a mixologist is someone who is highly skilled at mixing drinks while mixology is a more in-depth study of the art behind mixed drinks. While all mixologists are considered bartenders, not all bartenders are considered mixologists. Because let’s be honest, not all bartenders can mix up a drink, but they are great at pouring the wine. But, give a mixologist a potato and a fig and they can create a drool-worthy concoction. A mixologist will create craft cocktails, and prepare homemade ingredients for their brainchild. Mixologists know more about cocktails than just the basic ones typically ordered and served at a bar or restaurant. The mixologists mixology skills know no bounds. However, make no mistake, just because the term mixologist sounds fancier than bartender, in the end, it’s just a name that’s no different than calling a secretary and administrative assistant. The employment outlook for bartenders looks like it's slowing down to 2% between now and 2026. This growth rate is much slower than most other occupations. This doesn't mean there won't be jobs, there will just be more people filling out applications for the ones available. Job competition is strongest in high-end establishments where the hourly rate and tips are higher than in lower-end bars. Graduating from a bartending school may give you an edge on the competition. Although, some places only care about your speed, accuracy, personality, and how well you mix a good drink. Like the factors that go into a bartender’s salary, geographical locations and the type of industry where you’ll be potentially working are things to look at when considering a job. Some have better employment and pay opportunities than others. Also, because there is such a significant job turnover every year, there are plenty of job openings available for bartending. Let’s take a look at some graphs to get a better idea of employment in various sectors. *Reported income is strictly the hourly wage. Tips are not accounted for in these figures. When it comes to the salary of bartenders, there is a lot of varying information out there. For example, The Bureau of Labor Statistics states that bartenders make an average of $10.00 per hour, which is under $20,000 annually. However, and that’s a big, weighted ‘however’; there are so many varying factors that determine how much a bartender’s salary is. Take tipping, for instance. The average bartenders salary is made up from more than 55% tips. The actual salary reports do not show an accurate reflection of what bartenders can potentially earn. Figure if the hourly salary is the average at $9.39, some bartenders say that, with their tips, they are averaging around $30 per hour or more! But, it depends on where they work. The location is a huge factor in a bartender’s salary. If you are working in a bar that is notoriously slow, then figure you’ll earn right around what the average salary is reported to be. But, if you snag a bartending job in a swanky nightclub or high-end restaurant, there have been claims that a six-figure salary is reachable. So, a bartender’s salary is a combination of an hourly salary plus tips. And tips can end up tipping the pay into a higher tax bracket. You’ll find better paying bartending gigs in metropolitan areas. Check out this handy, dandy chart; the information was gathered over on the Bureau of Labor Statistics website. Due to the Fair Labor Standards Act, in some states, employers do not have to pay tipped employees more than $2.13 per hour, so bartenders heavily rely on tips to offset their measly salary. The upside to the FLSA is that cash tips can go unreported to the government because there is no way to trace them! So, if you’re working in one of those establishments that only pay $2.13 per hour, yet you’re rolling in thousands of dead presidents and stuffing them under your mattress, you don’t have to pay taxes on it. But, you’re paying taxes on that $2.13, which ends up being no big deal. Except, if you get tipped on credit cards, then you do have to report it as income because it is traceable to Uncle Sam. And, as we know, he wants YOU to pay your taxes. A bartender who is just starting out should see around $23 per hour, including tips. So, one 10-hour shift should put about $230 in your bank account, which is about the average for bartender newbies per night. The common theme around bartender salary is that there is no consistency, aside from the hourly rate. One night, you can make next to nothing, while the next evening (and this solely depends on where you work) can bring in $1,000. A tip for bartenders is to save money where you can because you just never truly know exactly how much money you’re going to make.